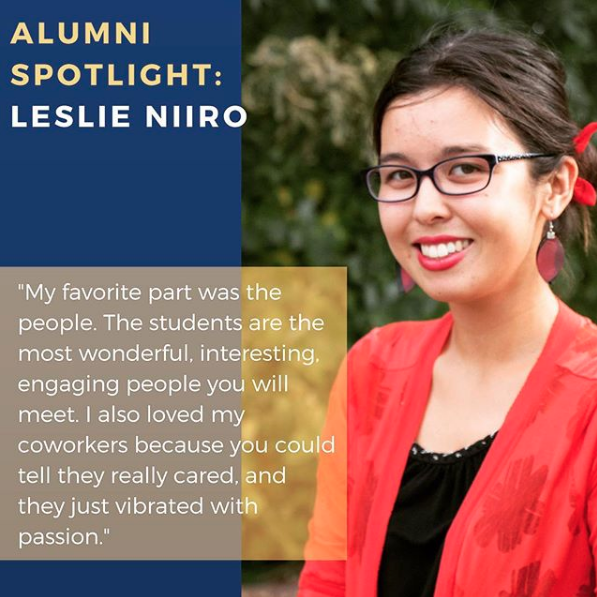 Duke College Advising Corps Alum, Leslie Niiro, shares her thoughts on the value of working with CAC. When Leslie Niiro enrolled in a Duke Service-Learning class on “Latino/a Voices in Duke, Durham and Beyond,” she embarked on an educational pathway which very clearly highlighted the value of a program like the College Advising Corps (CAC). “It was so powerful to see how education in Durham is so different depending on who you are or where you’re from or what language you speak; the information gap is huge,” Niiro reflected. From there, Niiro sought additional opportunities to continue to engage with Spanish-speaking families in an effort to close that information gap. The Duke Office of Durham and Regional Affairs pointed her to Juntos, a program based out of North Carolina State University whose mission is to help Latino students achieve high school graduation and attend higher education. There, as part of a DukeEngage Independent Project, she honed the skills and passion which would translate perfectly to her role as a College Adviser, helping students clarify their educational goals. Working as a College Adviser at Riverside High School in Durham allowed Niiro to extend one of the things she enjoyed most during her time at Duke: learning from the Durham community. Since CAC uses a near-peer model, Niiro found it easy to form meaningful relationships with her students. She was able to gain honest insight into their experiences as students and she found that these student interactions were easily her favorite part of the position. The personal connections kept Niiro going, as she worked with “some of the most wonderful, engaging people you will ever meet,” both students and staff. When she felt some inevitable moments of discouragement, she greatly appreciated the advice and support of her Riverside coworkers, who “vibrated with passion” and so clearly cared about the students. “I felt this prior to CAC, but my experience really crystallized [that] education is the key to opening a lot of doors, and it’s something that’s easy to take for granted if you don’t see the hurdles,” Niiro explained as she pointed out all of the pieces of a college application which could function as barriers for those without the knowledge, language or resources to navigate it. She saw the value of providing additional educational resources at the high school level, but was left wondering what it would be like to have that kind of support at every level of education. Niiro’s experience as an Adviser prompted her to ask a lot of big questions which continue to guide her own educational pathway as she completes her master’s degree in history. After this, she hopes to pursue a meaningful career that integrates her intellectual passions, her CAC experience and her personal goals, while addressing historical and social inequities.